Town manager Billy Heath says it was another game of two halves from The Shaymen after they drew 0-0 at Chester. Halifax were the better side in the first-half before fading after the interval - in contrast to their previous outing at Barrow where they recovered from an inferior first-half with an improved second-half display. Both games finished goalless, meaning Town are still without a goal this season, but Heath was happy with the point. He said: “Any point away from home is a good point. I thought we played really well first-half - we kept the ball better. “Second-half we lost Michael Duckworth through a hamstring injury, we lost Matty Kosylo with a hamstring injury. He felt it at half-time but he wanted to give it another 10 minutes. So we lost our balance a bit. Town gave few chances away in the game, but didn’t create much either, and while Heath is delighted with his team’s defensive solidity, he says there needs to be more from his side in attack. “Matty Brown and Scott Garner have been absolutely tremendous from the first minute of the season,” he said. “They’re well backed up with Sam (Johnson) and the two full-backs. We look a solid unit and that we’re not going to give that many goals away. “But it’s just the other end of the pitch where we’re still searching for our goal but I think we’ve had one kicked off the line. “The biggest criticism we’ve got is how many shots we had that didn’t hit the target, which is something we’ve been working on. We did have a lot of shots but we didn’t hit the target. “It’s always a concern. We’ve had opportunities but we’ve got to play more percentages around the box. If you get a chance to shoot in and around the box you’ve got to hit targets. 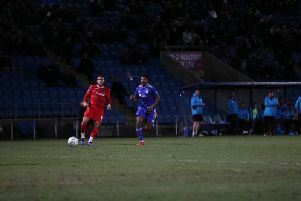 Fan favourite Adam Morgan made his first appearance of the season off the bench. Heath said: “The Town fans seem to love Morgs, they might love somebody else next week. “I make the choices that I think are best for the team. It was nice for him to get on. He’s been chomping at the bit, he’s done everything he can do. “He’s never let his head drop, his attitude has been fantastic. “He did OK but the game had got very bitty, which was unfortunate for Morgs because the rhythm had gone out of the game for both sides. “He still managed to get in some little areas and had a shot that was offside. Heath remains optimistic about Town’s chances this season based on what he has seen so far. He added: “After three games in this league we’re very competitive, very solid and all the players have given 100 per cent. “Nobody can say in any of the games that the desire hasn’t been there in abundance, and that’s what you need. That’s what will stand us in good stead.